AUSTIN, Texas — Hundreds are flocking to the Texas capitol building today to testify in support of a bill that would completely outlaw abortion in the state, and supporters are encouraging fellow residents of the Lone Star State to still arrive at the capitol this evening to be a part of the historic hearing. 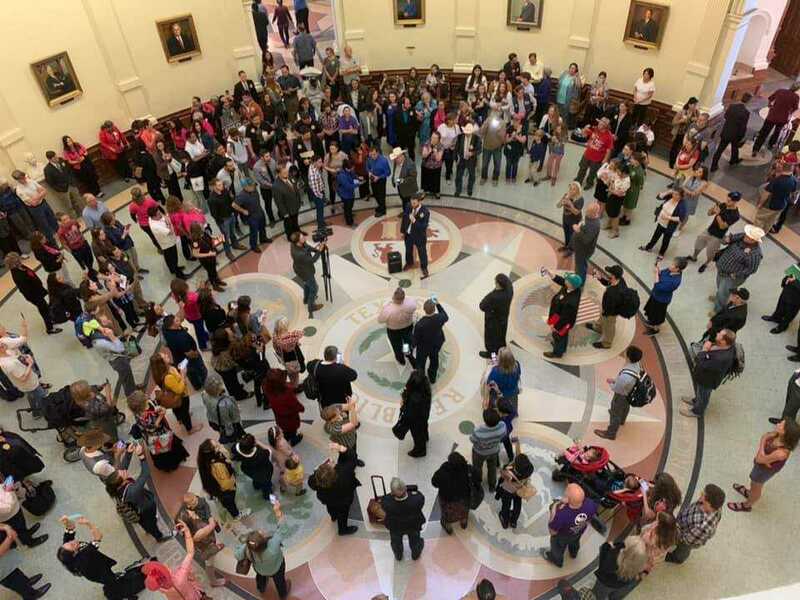 According to video updates posted online by Abolish Abortion Texas, an estimated 300-400 people were in the building as of 2 p.m. this afternoon to testify before the House Committee on Judiciary & Civil Jurisprudence. The sounds of “Amazing Grace” and “A Mighty Fortress Is Our God” filled the rotunda, and at one point, those gathered got down on their knees to pray for an end to abortion. Exuberant chants of “abolish abortion” also filled the air. The hearing for the bill had not started yet as of press time, but once it does, it will likely go into the late evening due to the large number of residents who wish to testify in support of the measure. Residents will be allowed one minute each to speak, again due to the size of the crowd. According to instructions provided earlier in the day by committee Chairman Jeff Leach, signs are not allowed within the hearing rooms, but t-shirts with messages on them are permitted. Those interested in testifying must also register upon their arrival. According to VoteSmart, Tinderholt identifies as a Roman Catholic and attends Saint Vincent De Paul Catholic Church in Arlington. Recently, the bill was assigned to the most favorable committee possible, chaired by Rep. Jeff Leach, R-Plano, who co-sponsored an identical bill to abolish abortion in 2017. Rep. James White, R-Hillister, who also serves on the Judiciary & Civil Jurisprudence committee, is already a co-sponsor of the current measure. Thomas’ parents and siblings are expected to be among those testifying this evening. Abolish Abortion Texas told Christian News Network that it is not known whether or not the committee will immediately vote on the bill following public testimony, but that supporters of the measure are urging legislators to do so. A vote could also come at a later time, even the following day. Editor’s Note: Those who are unable to attend the hearing, but would like to watch the live feed, may do so here or here.